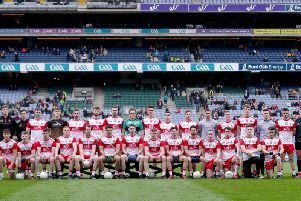 The Oak Leafers had Paddy Kelly, Darragh McCloskey and Conor McSorley all sent off in the 22-point loss with McCloskey and McSorley missing out this weekend as a result of their dismissals. “The squad we have, these players stick together. We have lost a lot of players but they are working very hard for each other. I cannot say a bad thing about them and I’m sure they will be keen to put it right this week. Alan Grant’s return will help offset the loss but, with Derry currently bottom of Division 2A after a tough opening three fixtures, McLean says he still has faith that the players’ hard work will pay off. “What can you say about last week, it wasn’t what we were expecting or wanted,” said McLean. “We had actually started quite well and were leading on a couple of occasions. Then a few decisions went again us and we lost a man. The players became frustrated and heads dropped but we have put it behind us. Apart from the loss of McCloskey and McSorley, the Derry manager has a full squad to choose from with Anton Rafferty and Breandan Quigley coming in for the suspended duo. The league table does not make for pretty viewing from a Derry perspective with the Oak Leafers bottom, one point behind Kildare and three behind Sunday’s opponents. However, with a game against Kildare still to come, victory over London this weekend could change the outlook considerably and ensure the Oak Leafers’ destiny remains firmly within their own hands.